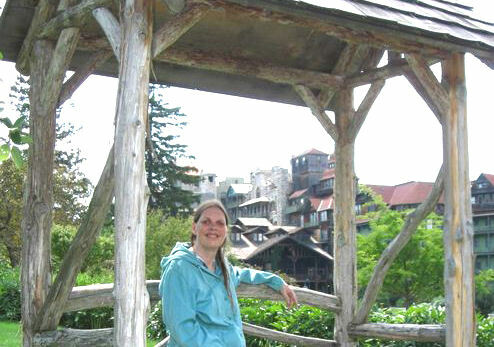 Robi Josephson photographed in the gardens at Mohonk. Photo by Ted Reiss. Back in late 1960s, a new college student found herself deep inside the Labyrinth, a steep rocky path leading through boulder rubble from Lake Mohonk up to Sky Top in the northern Shawangunk Mountains (a.k.a. The Gunks) of Ulster County, New York. The Labyrinth was then part of freshman orientation at the State University of New York at New Paltz. That young woman was me, one of a long line of students helping one another face our fears and reach the summit, including 100 steps to the top of the Albert K. Smiley Memorial Tower on Sky Top. Our reward was a 360-degree view of six states and congrats from the fire observer, who gave each of us a card with our name and his signature. I lost my card long ago but know others who have kept theirs all these years.